Boughton, or Boulton, was originally part of the manor of Wick Episcopi. In 1429 the estate was bought by Henry Gower who built a house on it. The early history of the house is simply the story of the Gower family for the next 300 years. It was sold in 1739 according to Nash, the Worcestershire historian, to pay gambling debts. The new owner was one Joseph Weston a Worcester wine merchant, Mayor of Worcester in 1720. In 1778 Mary Weston, widow of Joseph Weston sold a portion of the estate to William Lilley and the remainder to Thomas Bund. The Rev. John Lilley, son of William Lilley, sold part of the land to Elias Isaac and the remainder to Joseph Helm. In 1814 Elias Isaac bought Helm's share of the land and so became owner of the estate and Boughton House. This Elias Isaac, who is the gentleman of the portrait in the Clubhouse lounge, was a member of the banking house of Berwick & Co. In 1819 he became Mayor of Worcester. From 1821 to 1835 he was an alderman and in 1821 he was also High Sheriff of Worcestershire. In 1806 he married Harriet Whitmore of Dudmaston House in Shropshire and the couple took up residence in Boughton House in 1814. Harriet is the lady of the comparison portrait in the Clubhouse lounge. Elias died in Boughton on November 21st 1841 and the upkeep of the house and estate passed into the hands of his son, John Whitmore Isaac who had been born in 1807. John Whitmore also succeeded his father in Berwick's bank. He married Charlotte Holland of Dumbleton who was related to Josiah Wedgewood, the famous potter and to the naturalist Charles Darwin. John Whitmore, who was keen on improving the estate regrouped and reshaped the smaller fields within the estate, growing wheat and flax and establishing as a vegetable garden the ground where the 12tn green is now and at that time was known in the family as the 'round about ts'. He also became very keen on arboriculture and it was he who introduced and planted in the estate a considerable variety of trees many of them from Europe or North America. John Whitmore Isaac lived on in Boughton until he died at the age of 77 in 1884. His mother Harriet, Elias' widow, also lived on in Boughton dying m 1867 at the age of 80. Unfortunately John Whitmore's son, John Swinton Isaac died before his father and the estate and house passed to Arthur Witmore Isaac who was John Swinton's son by his second wife, Anne Amelia Crofton. His first wife, Elizabeth Ann Isaac died in 1870. Arthur Whitmore Isaac was killed in action in 1916 in World War 1, but before his death the estate and house was leased to a Lancashire industrialist named Marriage. One of Mr. Marriage’s daughters married a Colonel Winnington. Later the family moved to Bowbrook House near Pershore. 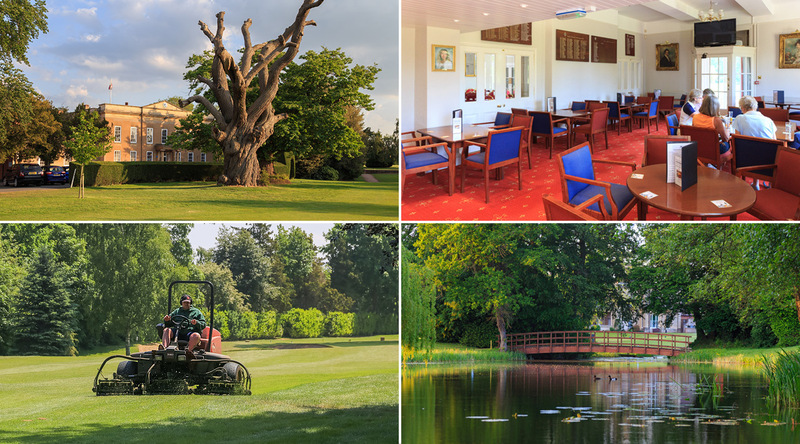 The estate which was then being managed by a Trust on behalf of the surviving members of the Isaac family was bought in 1927 by the Worcester City Golf Club of Tolladine and became the Worcester Golf & Country Club. The deed of sale was signed on behalf of the golf club by Russell Randall the secretary, William Badgery and Francis Marrian and for the trustees by Arthur Whitmore's friend, the then Prime Minister Stanley Baldwin, who later became Earl Baldwin of Bewdley and Lucy Isaac (formerly Lucy Vernon) Arthur Whitmore Isaac's widow. This brief history of Boughton House, now the Clubhouse of Worcester Golf & Country Club, was made possible through the help of Miss Gill Farnsworth, Deputy Curator of the Worcester City Art Gallery and Museum.